For the Canadian artist, see Chris Dyer (artist). Chris Dyer (born 12 February 1968) is the head of Vehicle Performance Group at Renault Sport Formula 1 Team and the former race engineer of Michael Schumacher and Kimi Räikkönen at the Ferrari Formula One team. Born in Bendigo, Victoria, Dyer worked with the top V8 Supercar outfit, the Tom Walkinshaw owned Holden Racing Team in the mid nineties alongside drivers such as Peter Brock and Craig Lowndes. In 1997, he switched to Walkinshaw's Formula One team Arrows, working as Damon Hill's chief data engineer. In 1998, he stepped up to race engineering, working with drivers such as Jos Verstappen. For the 2001 season, Dyer moved to Scuderia Ferrari, working as Michael Schumacher's vehicle engineer, alongside Luca Baldisserri. 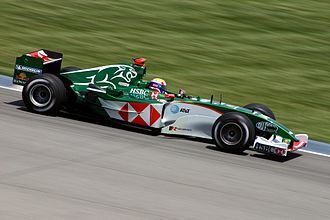 By the end of 2002, Dyer engineered Schumacher at the tests, and after the championships had been won, at the last three races at Monza, Indianapolis and Suzuka. Dyer then race engineered Michael Schumacher to his 2003 and 2004 world titles, appearing with the German on the podium after his triumph at the 2003 Canadian Grand Prix. Dyer was quoted saying that 'One of Michael’s strengths is that, apart from driving quickly, he has an understanding of the car and how all the systems work'. Dyer then took over as Kimi Räikkönen's race engineer when the Finn moved to Ferrari in 2007. 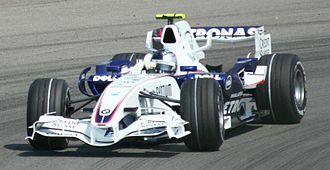 Despite suggestions that the pair didn't always get the most from the package, Räikkönen took the title in 2007 at the final race by a single point over Lewis Hamilton and Fernando Alonso. However, after the disappointing results in the 2008 season, Ferrari announced that Dyer would be replaced by Andrea Stella for the 2009 season, with Dyer promoted to chief track engineer. 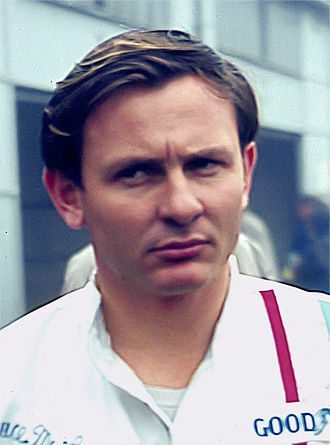 On 4 January 2011 Ferrari announced that Dyer was replaced as head of race track engineering by former McLaren engineer Pat Fry. This decision was taken after Dyer made the call to bring Fernando Alonso into the pits to cover off the Australian Mark Webber's pit stop in the final 2010 race, at Abu Dhabi. This decision was blamed for costing Alonso the drivers title, in favour of Sebastian Vettel who went on to become champion. In October 2012 it was announced that Dyer was to join BMW's DTM programme as chief engineer. On 4 February 2016 it was announced by Renault Sport that Dyer would be returning to F1 as their head of vehicle performance group. ^ "The Ferrari Team Profile". Retrieved 2 September 2013. 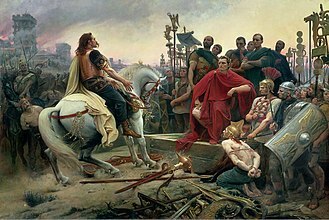 ^ a b "Guiding the world champion". 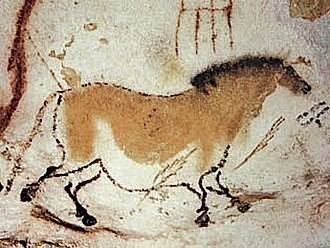 TheScuderia.net. Retrieved 2 September 2013. ^ ...And kimi be so slow: retrieved 29 October 2008 Archived 9 November 2008 at the Wayback Machine. 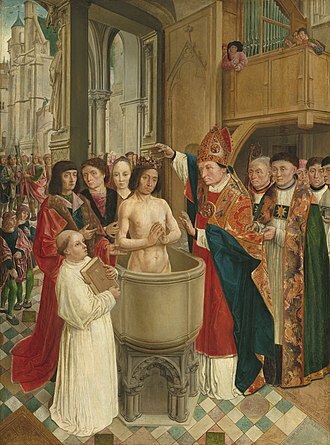 ^ Jonathan Noble (4 January 2011). "Ferrari reshuffles engineering staff". Autosport.com. Retrieved 5 January 2011. Bendigo /ˈbɛndᵻɡoʊ/ is a city in Victoria, located very close to the geographical centre of the state and approximately 150 kilometres north west of the state capital, Melbourne. As of June 2015, Bendigo had an population of 92,888, making it the fourth largest inland city in Australia. The discovery of gold in the soils of Bendigo during the 1850s made it one of the most significant Victorian era boomtowns in Australia, once the alluvial gold had been mined out, mining companies were formed to exploit the rich underground quartz reef gold. It is notable for its Victorian architectural heritage, the city took its name from the Bendigo Creek and its residents from the earliest days of the goldrush have been called Bendigonians. 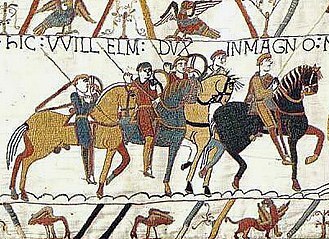 Although the town flourished in its beginnings as a result of the discovery of gold, its growth accelerated in the post-war years and has continued to increase steadily since. Bendigo is the largest finance centre in Victoria outside Melbourne as home to Australias only provincially headquartered retail bank, the original inhabitants of the Mount Alexander area that includes Greater Bendigo were the Dja Dja Wurrung people, who exploited the rich local hunting grounds. These grounds were eventually noticed by white settlers, who established the first of many vast sheep-runs in 1837, the Mount Alexander North sheep-run was bordered by a creek that came to be known as Bendigo, after a local shepherd nicknamed for the English bare-knuckle prizefighter William Abednego Thompson. In 1853, there was a massive protest over the cost of the fee for prospectors, though it passed off peacefully, thanks to good diplomacy by police. 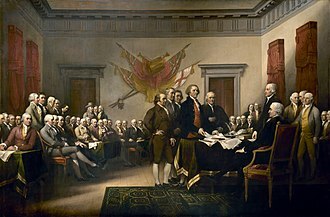 From being a tent-city, the boomtown grew rapidly into an urban centre with many grand public buildings. 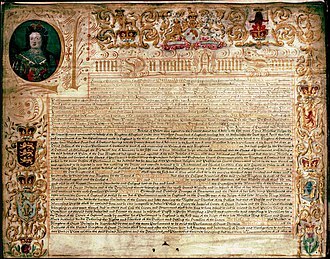 The municipality became a borough in 1863, officially known as Sandhurst until 1891, when the alluvial gold ran out, the goldfields evolved into major mines with deep shafts to mine the quartz-based gold. Bendigo was declared a city in 1871, rapid population growth brought a water shortage, partially solved with a new viaduct that harnessed the Coliban River. The architect William Charles Vahland left an important mark on Bendigo during this period and he is credited with the popular cottage design with verandahs decorated in iron lace, a style that was soon adopted right across the state of Victoria. Vahland designed more than 80 buildings, including the Alexandra Fountain, arguably the most prominent monument in Bendigo, with its granite dolphins, nymphs, a tram network was in use by 1890. After a temporary drop in population, there was renewed growth from the 1930s, as the city consolidated as a manufacturing and regional service centre, recent growth has been most heavily concentrated in areas such as Epsom, Kangaroo Flat and Strathfieldsaye. In 1994 the City of Bendigo was abolished and merged with the Borough of Eaglehawk, the Huntly and Strathfieldsaye shires, the population of the city increased from around 78,000 in 1991 to about 100,617 in 2012. Bendigo is currently one of the fastest growing regional centres in Victoria, the City of Greater Bendigo includes Victorias fourth largest city in Bendigo, as well as a significant rural hinterland. Smaller townships are located at Axedale, Goornong, Marong, the city encompasses a total land area of 3,000 square kilometres, of which a significant proportion is national park, regional park, reserve or bushland. Renault Sport Racing and Renault Sport Cars, both commonly known as Renault Sport or Renaultsport, are the motorsport and special vehicles divisions of Renault. 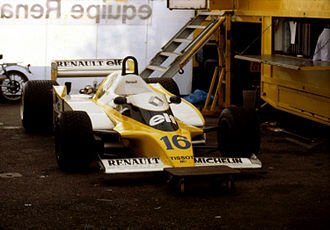 Renault Sport was officially established in 1976 as a merger between the Alpine and Gordini competition departments, Renault Sport Racing organises many Renault-backed one-make championships worldwide and is in charge of Renault groups official involvement in motor racing, including Formula One. The Dieppe-based Alpine department specialised in the construction of race car chassis while the Viry-Châtillon-based Gordini focussed on engines, several conflicts emerged between them, and Renault took the decision to unify both departments into a single location in order to achieve a greater integration and harmony. 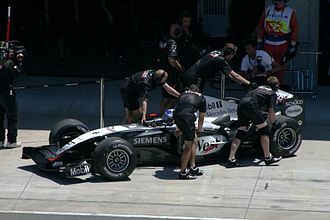 The company concentrated principally on developing a car for Formula One, in 2002, the Viry-Châtillon factory became the engine department of the Renault F1 team and Renault Sport was moved to Les Ulis and renamed Renault Sport Technologies. On 3 February 2016, Renault announced a reorganisation of its racing, the Formula One operation and RSTs former motorsport branch were put under the new Renault Sport Racing division. RSTs former roadcar branch at Les Ulis became the Renault Sport Cars division, gordini-tuned Renault cars won many rallies during the 1950s and 1960s, and Alpine, being a subsidiary of Renault, won the first World Rally Championship in 1973. In the WRC, Renault had some success with such as the R5 Turbo. The European Rally Championship was won three times by a Renault car, on 21 February 2013, Renault Sport Technologies announced its official return to international rallying in the European Rally Championship. In 1979, the Marreau brothers finished in place in the cars category at the Rally Dakar driving a Sinpar-prepared 4L 4x4. They won the 1982 edition with a Renault Sport backed Renault 20 Turbo 4x4, Renault Sport powered and sponsored the Schlesser-Renault Elf buggies which won the 1999 and 2000 editions. 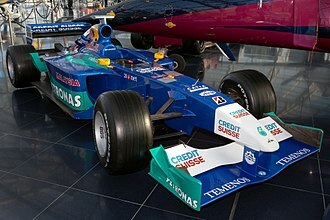 The 1999 car was the first two-wheel drive Dakar winner, Renault was one of the first car manufacturers involved in the Formula E championship. For the inaugural season, Renault Sport became a partner of the series. 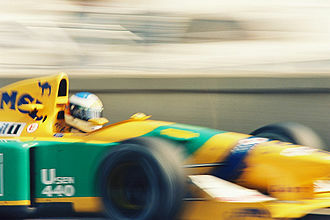 The new powertrain manufactured by Renault Sport was named Renault ZE15, from 1977 to 1986 and again between 1989 and 1997, Renault Sport was in charge of Renaults Formula One programme. In 2016, the Formula One operation became part of Renault Sport Racing, Alpine constructed various chassis and prepared engines for Formula Two. In 1973, Renault-Gordini introduced a two-litre V6 engine for F2, the CH, jean-Pierre Jabouille and René Arnoux won the 1976 and 1977 European Formula Two Championships with Renault-powered cars. Note, During this season Scuderia Everest entered Renault-powered cars and Alpine-tuned Renault engines were used in various Formula Three series since the 1960s. Alpine developed cars for the category, in 1979, Alain Prost won the FIA European Formula Three Championship with a Renault engine prepared by Oreca. Craig Lowndes OAM is an Australian racing driver competing in the Supercars Championship. He currently drives the No.888 Holden VF Commodore for Triple Eight Race Engineering and he is the first driver in ATCC/V8SC history to win 100 races and holds the record for the most Bathurst 1000 podiums with 13. Craig Lowndes is the son of former long-time Confederation of Australian Motorsport Chief Scrutineer Frank Lowndes, Lowndes began his racing career at age nine, driving go-karts at a track in the town of Whittlesea. He moved up to cars in 1991, driving a Van Diemen in the Motorcraft Formula Ford Driver to Europe Series. Despite the car being several years old and receiving minimal sponsorship, Lowndes won the Australian Formula Ford Championship in 1993 which qualified him for the Formula Ford Festival in England that same year, where he finished third. 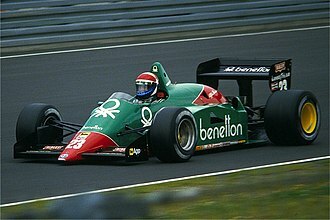 Lowndes moved up to Australias top rank of open wheel racing being Formula Brabham in 1994 and his success in Formula Brabham driving an ageing Cheetah Mk9 against much more modern cars was rewarded with the Australian Silver Star. By this time Lowndes had been added to the Holden Racing Teams testing crew and he looked sufficiently promising in testing that Lowndes was drafted into the No.015 Commodore with Brad Jones for the 1994 Sandown 500. It was expected to be a performance as Rickard Rydell from the BTCC Volvo sister team within TWR was to join the team for Bathurst. Rydell was forced to stay home for reasons and after his impressive debut at Sandown. 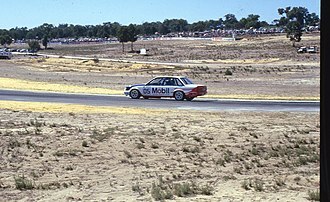 After a gruelling double-stint by Jones, Lowndes began the final stint of the race as the challenger to the DJR Falcon of John Bowe which had dominated the race. With eleven laps to go Lowndes stunned the touring car establishment overtaking Bowe on the outside of Griffins Bend in a move made him a household name. Bowe retook a lap and Lowndes was forced to back off in the closing laps, Lowndes won fans in pit lane when he admitted that his passing move on Bowe was simply a case of missing his brake marker. HRT had seen enough however and for the 1996 season replaced Tomas Mezera full-time in the team, at his first attempt, Lowndes won the championship and won both the Sandown and Bathurst races with teammate Greg Murphy. The 2010 Abu Dhabi Grand Prix was a Formula One motor race held on 14 November 2010 at the Yas Marina Circuit on Yas Island, an island on the outskirts of Abu Dhabi in the United Arab Emirates. 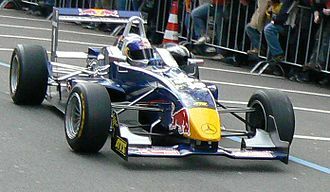 It was the 19th and last round of the 2010 Formula One season, the 55-lap race was won by Red Bull driver Sebastian Vettel after starting from pole position. 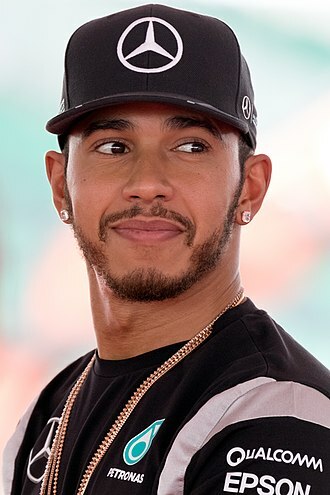 Lewis Hamilton finished second in a McLaren, and team-mate Jenson Button completed the podium, buttons third place allowed him to finish fifth in the championship standings, having been eliminated from championship contention at the previous race in Brazil. 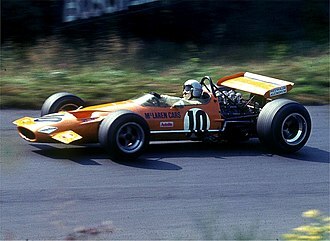 Due to injuries sustained in a crash prior to the 2011 Formula One season. 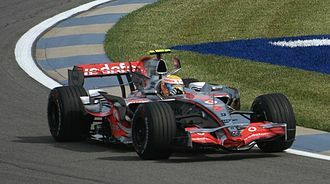 McLarens Lewis Hamilton was in contention on 222 points,24 behind Alonso with a maximum of 25 points available for the final race. 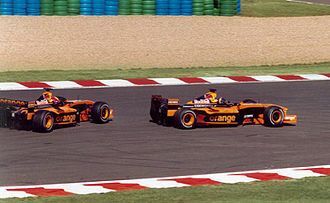 As a result, this was the first occasion that four drivers still had a chance of winning the Drivers Championship at the event of the season. McLaren were themselves not confirmed in second place in the championship, Ferrari used radio transmissions to allow Fernando Alonso to overtake team-mate Felipe Massa for the race victory and gain seven extra points towards the Drivers Championship. Sebastian Vettel himself had stated that he would help his team-mate win the championship if required, after 242 races since their full-time return in 1997, tyre supplier Bridgestone bowed out of Formula One, having been the sports single tyre supplier since Michelin pulled out after the 2006 season. 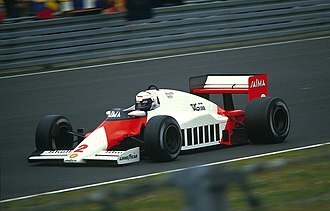 Pirelli took over the contract in 2011, returning to Formula One for the first time since 1991. Three practice sessions were held before the race, the first on Friday afternoon, the third session was held on Saturday afternoon and lasted an hour. 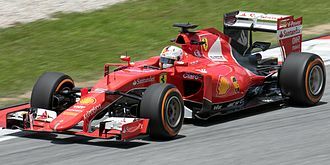 All three sessions were held in dry conditions, although the first session was held on a damp, Vettel was quickest with a time of 1,42.760 in the first session, just over six-tenths of a second faster than Hamilton. 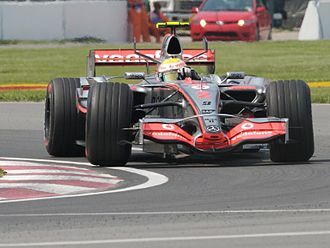 Button was another four tenths off Hamiltons pace, followed by Webber, Robert Kubica, michael Schumacher was seventh, the only other driver to be within 1.5 seconds of Vettels time. In the second session, Hamilton was fastest with a time of 1,40.888. The Ford Falcon of Craig Lowndes at Queensland Raceway, 23 August 2009.